Sidney’s Darren Taborn runs the ball as St. Marys’ Christian Triplett follows during a season opener on Friday at Skip Baughman Field in St. Marys. Sidney’s Caleb Harris runs the ball in the first half of a season opener on Friday at Skip Baughman Field in St. Marys. Sidney’s Joey Bishop, top, and Darren Taborn, bottom, tackle St. Marys’ Sean Perry in the first half of a season opener on Friday at Skip Baughman Field in St. Marys. View more photos for Sidney at St. Marys here. ST. MARYS — Sidney’s spread offense was difficult for St. Marys Memorial to stop in a season opener on Friday. When the Yellow Jackets didn’t give the Roughriders the ball, anyway. 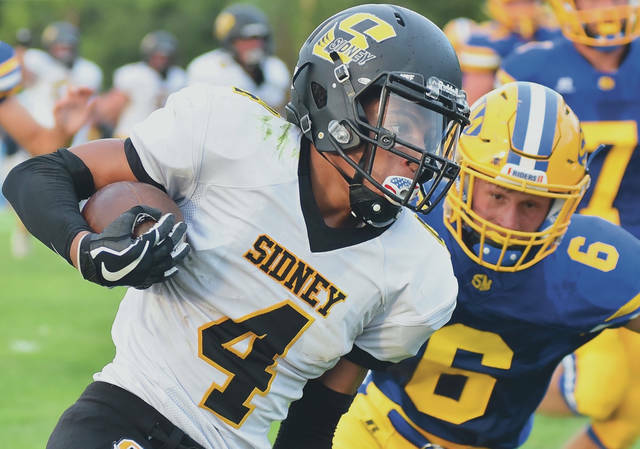 Sidney had five costly turnovers and lost 35-7 in a nonconference game at Skip Baughman Stadium. Three of the turnovers directly led to St. Marys touchdowns. After two fumbles led to St. Marys touchdowns in the first half, the Yellow Jackets opened the second half with another turnover. 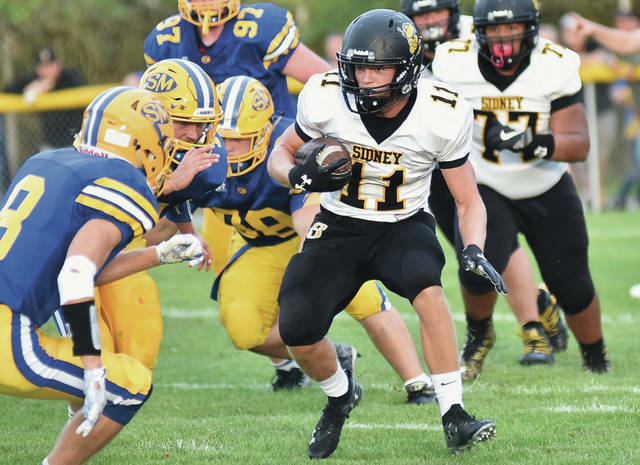 Lukas Walter deflected a screen pass by Sidney quarterback Ryan Dunham, and St. Marys defensive lineman Blake Kanorr grabbed the ball and rumbled 45 yards. The Roughriders scored four plays later on a fake field goal attempt. St. Marys quarterback Braeden Dunlap threw an 11-yard touchdown pass to Ethan Freewalt on the play to push the lead to 28-7 with 7:03 left in the third. Sidney was forced to punt on its next drive. St. Marys’ next drive ended when Sidney defensive lineman Joey Bishop forced a fumble near midfield and returned it to the 16. The drive ended two plays later, though, when Dunham had a deflected pass intercepted by Carson Fischbach. Dunlap scored on a 1-yard run with 5:59 left in the fourth to push the lead to 35-7. Sean Perry picked off a pass from Dunham later in the fourth quarter, and the Roughriders then ran out the clock. Two fumbles were costly for Sidney in the first half. St. Marys opened the game with a 14-play, 65-yard drive that Dunlap capped off with a 1-yard touchdown run with 6:07 left in the first quarter. The Yellow Jackets moved from their own 35 to St. Marys’ 33 on the ensuing drive but turned the ball over on downs. St. Marys was forced to punt on its next drive. Sidney took the ball over on its 2-yard line, but Caleb Harris ran 73 yards along the visitor’s sideline a few plays later to move it to St. Marys’ 10. Darren Taborn ran right around the line on the next play and dove into the end zone for a touchdown with 11:37 left in the second to tie it 7-7. St. Marys went three-and-out on its next drive. Sidney then fumbled on its next drive on St. Marys’ 37. The Roughriders capitalized on the turnover. Eddie Fowler capped off the resulting drive with a 4-yard touchdown run to put St. Marys up 14-7 with 2:11 left. The Yellow Jackets fumbled the ball away on their next drive on a failed hook and lateral attempt. The Roughriders scored one play later on a 33-yard halfback pass from Ty Howell to Carter Ballweg, which increased their halftime lead to 21-7. Friday’s game will be Sidney’s last at Skip Baughman Stadium and their last game in St. Marys for the foreseeable future. St. Marys will move to a new stadium near Memorial High School next season. Next year will be the last time the teams will play for at least several years. Sidney is joining the reformed Miami Valley League in 2019 and will start playing a nine-game conference schedule in 2020. Bellefontaine will remain as the Yellow Jackets’ lone nonconference opponent. Sidney (0-1) will host Bellefontaine at 7 p.m. next Thursday. Dunham completed 12 of 25 passes for 76 yards, while Sidney amassed 124 yards on the ground. Harris led the squad with 99 rushing yards on nine carries. Ratez Roberts caught six passes for 38 yards, while Lathan Jones caught five passes for 32 yards. Braydon Dean led Sidney with nine tackles while Ryan Cagle had 8.5. 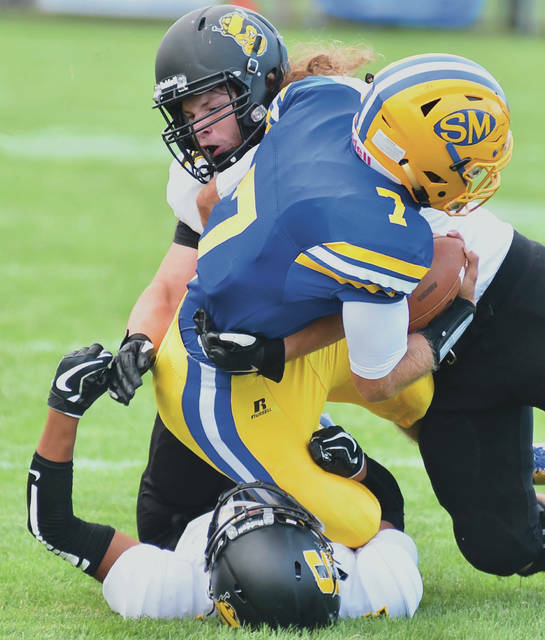 St. Marys amassed 284 yards of total offense, all but 44 of which game on the ground. Perry led the Roughridgers with 122 rushing yards on 22 carries. This entry was tagged Adam Doenges, Blake Kanorr, Braeden Dunlap, Caleb Harris, Carson Fischbach, Carter Ballweg, Darren Taborn, Eddie Fowler, Football, Greater Western Ohio Conference, GWOC, high school, high school football, Joey Bishop, Lukas Walter, opener, result, Roughriders, Ryan Dunham, score, Sean Perry, season opener, Sidney, Skip Baughman Stadium, st. marys, statistics, stats, Ty Howell, WBL, Western Buckeye League, who won, Yellow Jackets. Bookmark the permalink.